Four Color Tourmaline Earrings by Rachael Sarc. 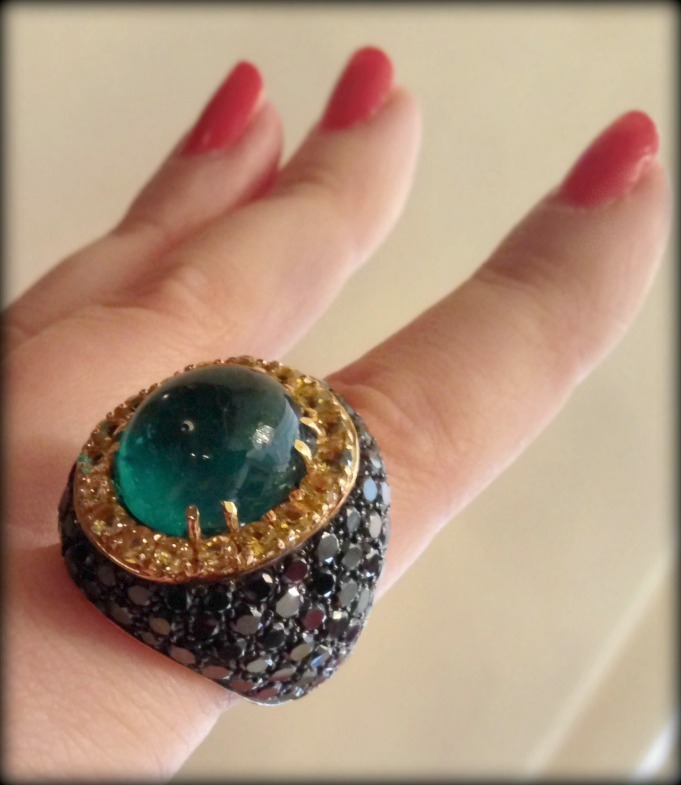 Do you remember a few weeks ago when I introduced you to the fabulous Rachael Sarc and her glorious gemstone jewelry? I actually saved a couple of pieces from her collection to show you in their own posts, because they were so amazing they had to be presented solo. Here is the first: Rachael Sarc’s Four Color Tourmaline Earrings. Each one-of-a-kind tourmaline drop is suspended from an 18kt yellow gold and platinum setting adorned with white and yellow diamond pavè. Aren’t the settings a gorgeous shape? It’s one of my favorite aspects of the design, besides those killer tourmaline drops. Rachael that the settings were inspired by the Eiffel tower, which she admired on a recent trip to Paris. Here’s a shot from Rachael Sarc’s Instagram of the tourmaline earrings when worn, alongside shots from the construction process. And here’s the tourmalines on their own, waiting for their destiny. I think that the settings Rachael Sarc created for these gemstone drops showcase the natural beauty of the tourmaline while adding visual interest and picking up the colors of the stones. Let’s get up close and personal. What do you think of Rachael Sarc’s Four Color Tourmaline Earrings by Rachael Sarc, my dears? Do you love them as much as I do? All images and info in this post are thanks to the fabulous Rachael Sarc. Photography by Mickey Kerr unless otherwise specified. Photo recap: JCK LUXURY Privé. As you know if you follow me on Twitter or Instagram, I recently had the privilege of attending my second JCK LUXURY Privé show. 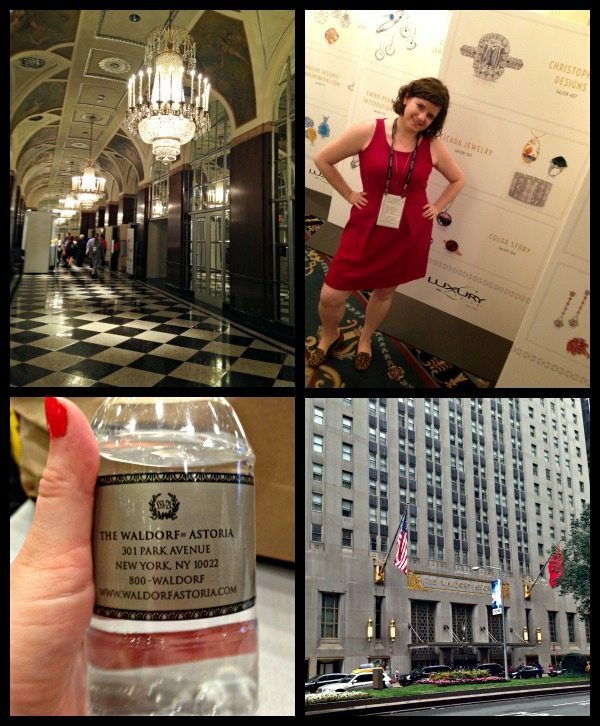 This industry-only jewelry show was held this year in the historic NYC Waldorf Astoria hotel, which was a wonderful venue choice, I must say. I met fabulous people and fabulous jewelry, both on the show floor and at the expertly curated Editor’s Preview, which culminated in a delightful lunch event for bloggers and designers alike. I also came home with a whooooooole lot of photos. I’ve been enjoying sharing some with you on Instagram and I’m going to share a bunch more with you today. I was far from the only blogger I saw spending time with these fab earrings from Andreoli. These are one from each of the two pairs. Which do you love more? 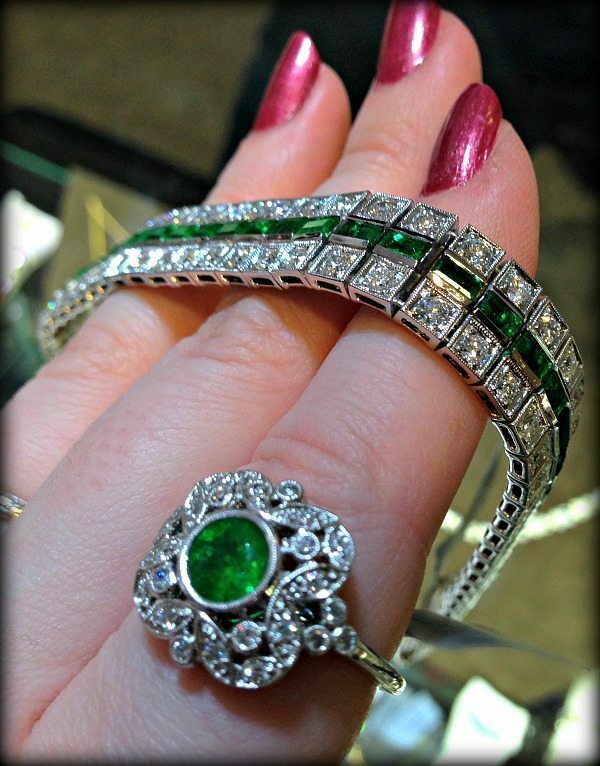 Andreoli also had this incredible cabochon emerald ring in the Editor’s Preview. That emerald was gorgeous: it practically glowed. I couldn’t help but smile while test driving Coronet Diamonds’ 20.60 carat diamond showstopper, the Hekate necklace. Don’t you love the shape of it? It’s pointier than I would expect from this kind of piece, and I think it works really well. I’m not really sure where the name comes in, but I like the idea of a bombshell diamond necklace named after a somewhat eerie mythical figure. This diamond slice necklace by Dilamani was one of my very favorite pieces of the whole trip. 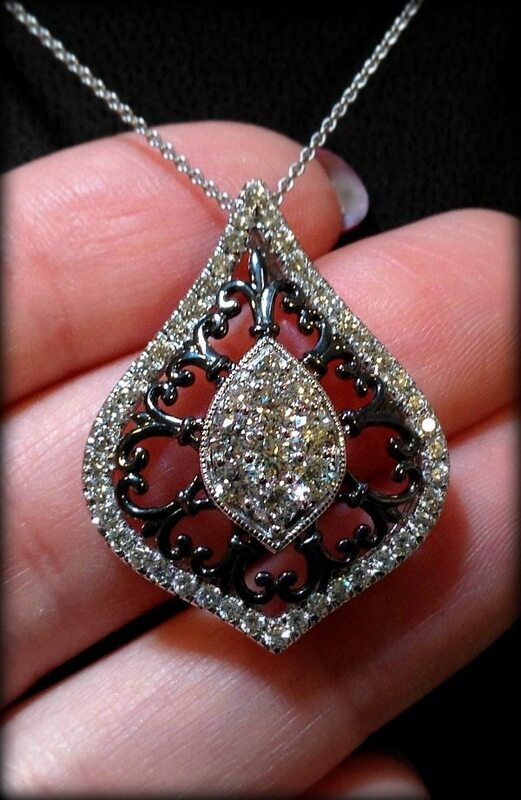 It’s 22 carats of naturally colored grey diamond slices set in 18k gold with 8 additional carats of round accent diamonds. It’s beautiful, but what really seduced me was how it felt when I put it on. Light and cool and impossibly delicate. It reminded me of when, as a child, I used to go the house of a friend who had woods in her back yard with a really good stream-bank for finding mica. We would fill our hands with the flaky, sparkly stuff and throw it in the air. This Dilamani necklace felt exactly that light, that enchanting. 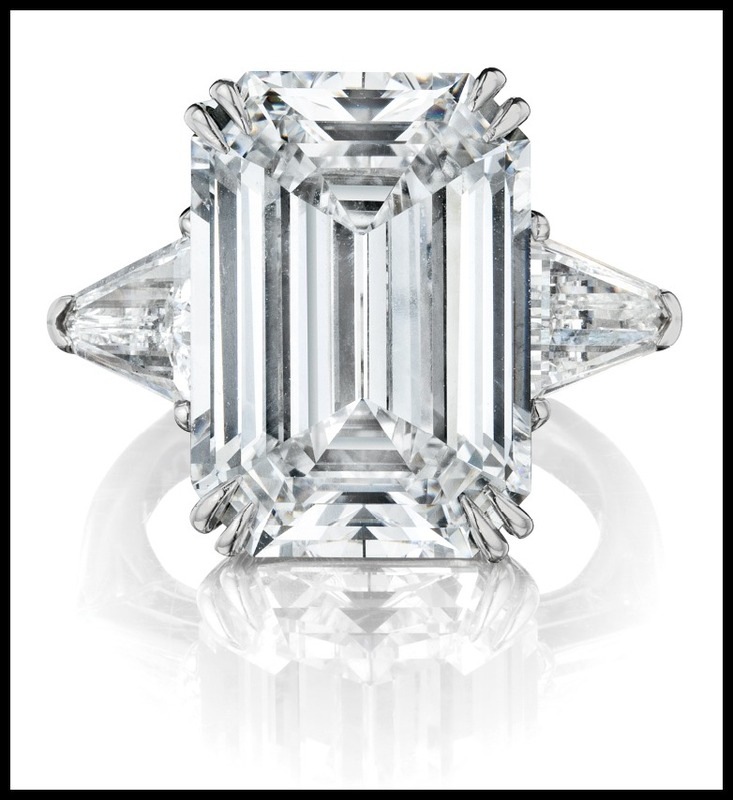 This bombshell of a ring is by David Mor, who apparently has a penchant for megawatt stones. This beauty has a yellow diamond and an emerald surrounded by variously cut white diamonds. What do you think of it? 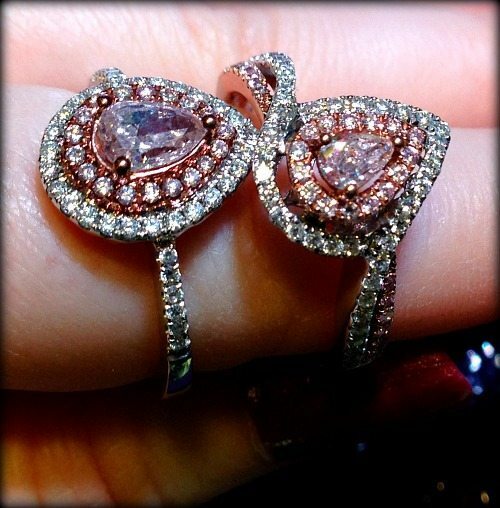 These David Mor pink diamond and diamond earrings were like something out of a dream. Same for Mor’s diamond and yellow diamond necklace. Yep, that’s my hand. Ah, memories. 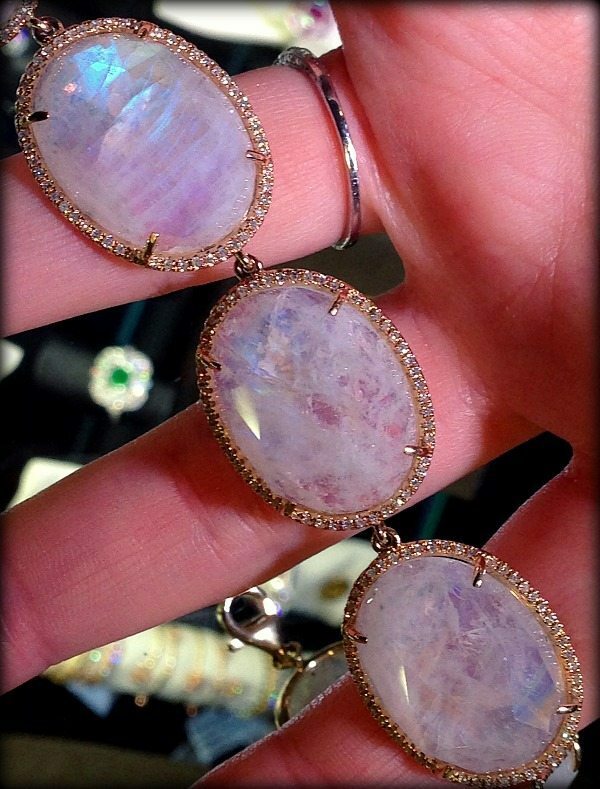 Another superfavorite: this perfect moonstone and diamond ring by Blackbird and the Snow. Doesn’t this piece make you want to see everything else they make? 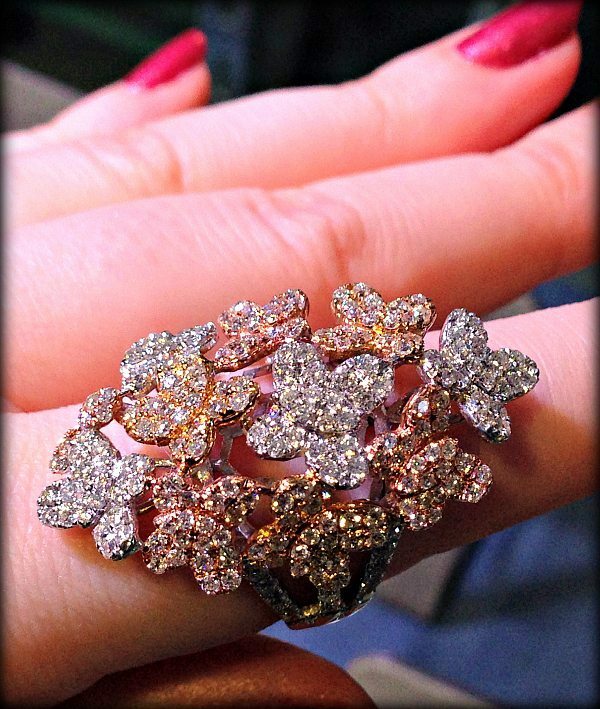 I’ve never seen anything quite like this hummingbird ring by Emiko Pearls. The details were breathtaking. Be sure to notice the texture on the inside of the wings, the carefully worked stem and petals of the flower, and the fact that the bird’s body is a perfectly contoured pearl. 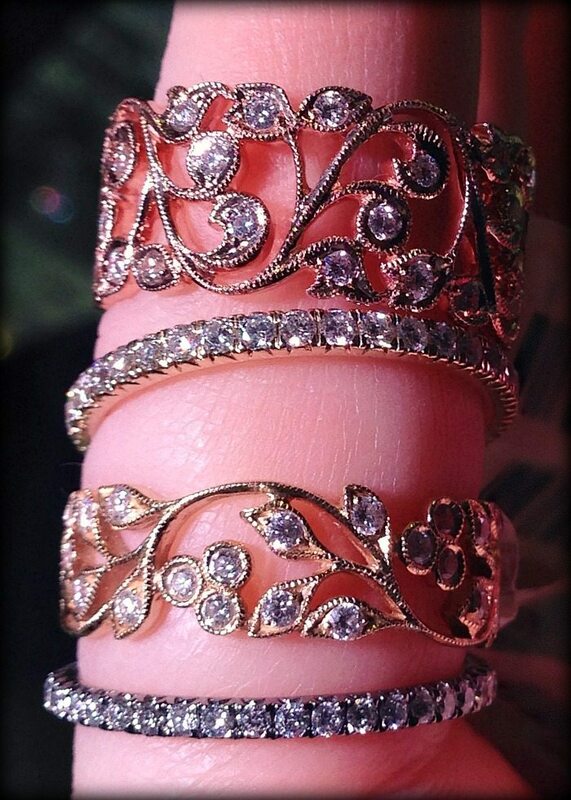 These H. Weiss gold and diamond lace cuffs were another of my absolute favorites. So softly beautiful, so infinitely wearable. I’m pretty sure I took 30 photos exactly like this one. Kaura Jewels’ slogan is “Modern Armor for the Urban Warrior,” which I think is awesome and badass. That’s also how I’d describe their jewelry, with the addition of “unique,” “boldly graphic,” and “gorgeous.” These are the Petal Strength earrings: 18k yellow gold with black ink, blue tapered baguette sapphires, opals, and pink sapphires. 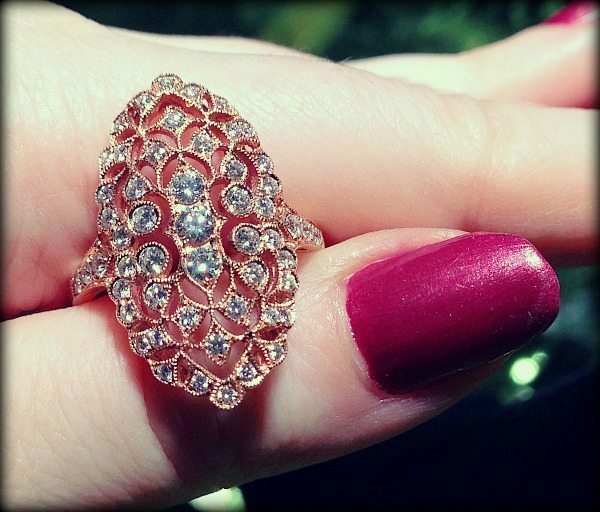 This is Kaura Jewels’ Balance ring, which (for the record) I would wear allllllll the time. 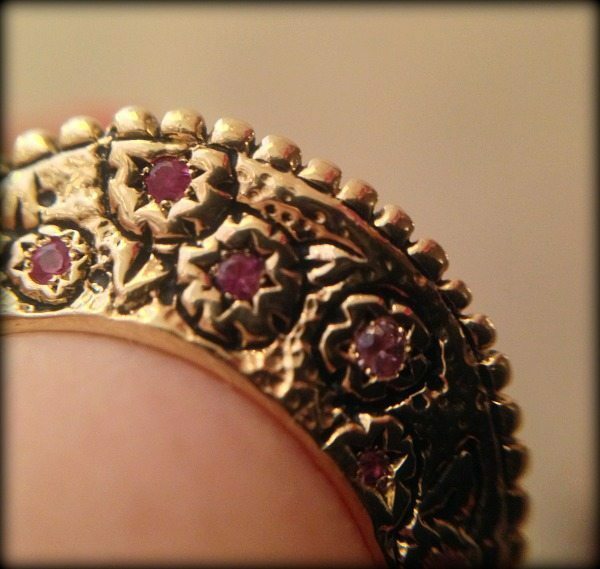 It’s different from either side, and it has the coolest shape: like a Russian kokoshnik tiara for your finger. I had to give you a closer look at those details. 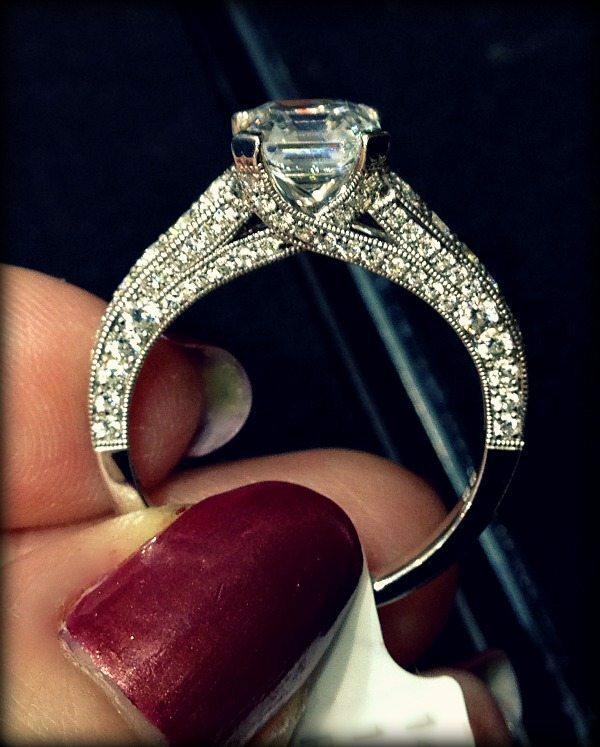 Have you ever seen anything like this ring? I hadn’t. I thought these A. Link and Co. diamond earrings were awesome. Such texture and sparkle. I tried to model them for you, but earring selfies are harder to take than you might think. A lovely tanzanite ring by LeVian in rose gold. Such good colors. 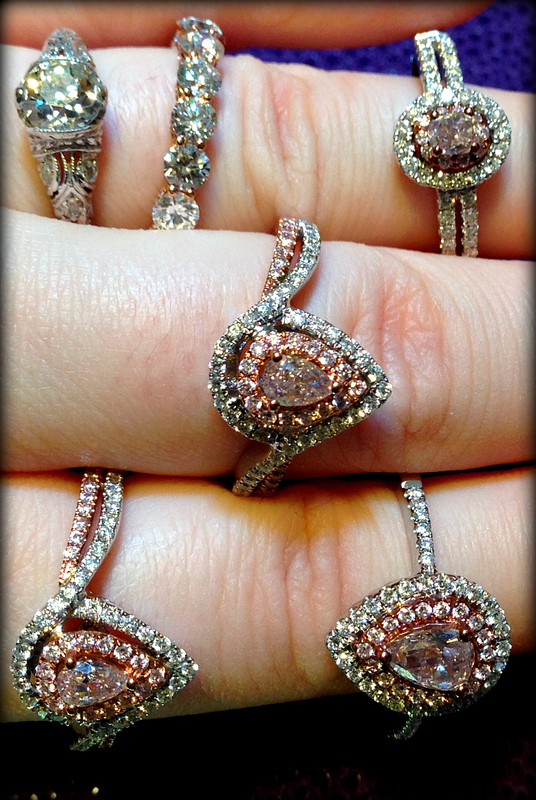 No photo could truly do justice to this amazing Love Doves morganite ring by Loretta Castoro. The 92 carat morganite in the center is matched for fabulousness by the sculpted rose-gold setting of doves that appear to be cradling the rosy stone in their wings. An epic Loretta Castoro pearl and morganite necklace, also from the Love Doves collection. This piece was seriously substantial; a multi-strand rope of pearls and morganite held together with a dove-shaped clasp. I would also like to observe that my skin is the exact same color as the morganite beads. This is why I can’t wear rose gold; it blends in. Back to Loretta Castoro for a kiss goodbye! This KissMe ring has a 5.3 carat pink tourmaline cradled in a sparkling tsavorite garnet pout. I have more beauties from LUXURY Privé to show you, but this seemed like quite enough for one post. Stay tuned for more soon! A huge thanks to JCK and Communique LA for this fantastic event. I had the most wonderful time. 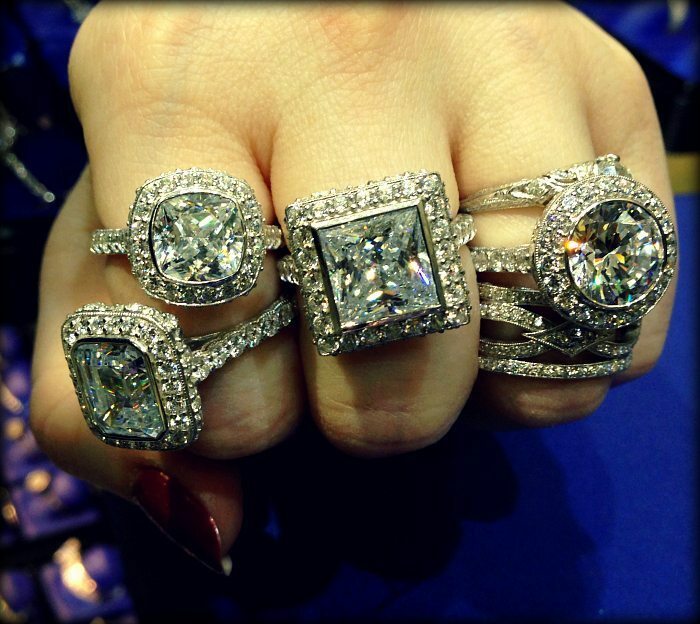 Exceptional gemstone and diamond rings. My goodness, what a week it’s been. If you follow me on Instagram, Twitter, and Facebook, you know I’ve been gallivanting around New York City having fantastic jewelry adventures. I’m still sorting through everything I brought home with me (I think I took over 3,000 photos) but rest assured I will have beauties to share with you from my trip soon. Be sure to check out my social media accounts for a sneak peek! I do have something lovely for you today, don’t you worry. 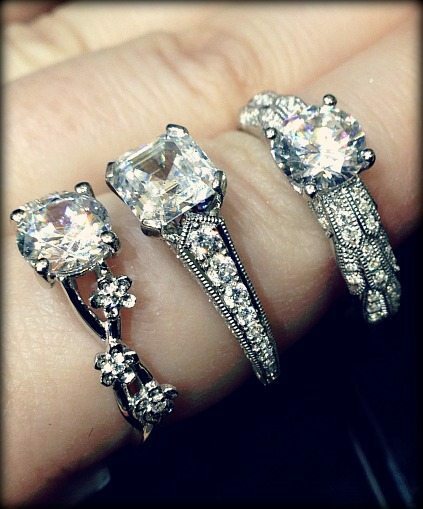 You know by now that I’m most likely to get hot and bothered about rings with tiny, beautiful details. But let’s be real: every once in a while you just want to see something with a big old honkin’ stone. 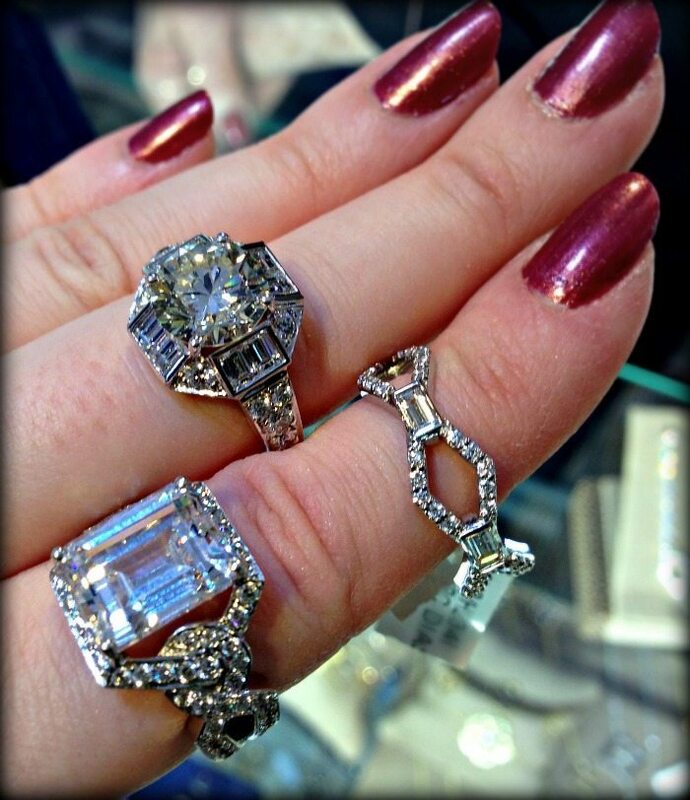 Here are some truly special gemstone and diamond rings from a recent Phillips auction that are all about the rocks. 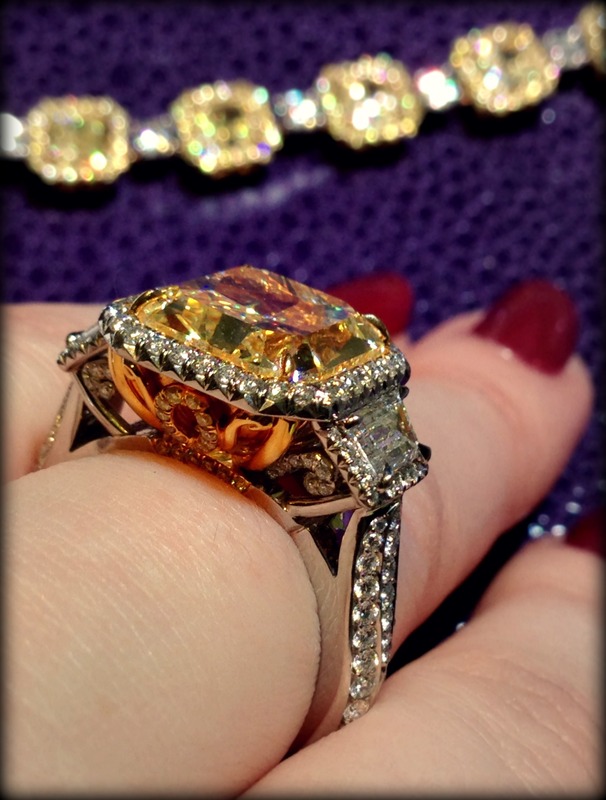 Our first ring is this to-die-for fancy intense yellow diamond ring. 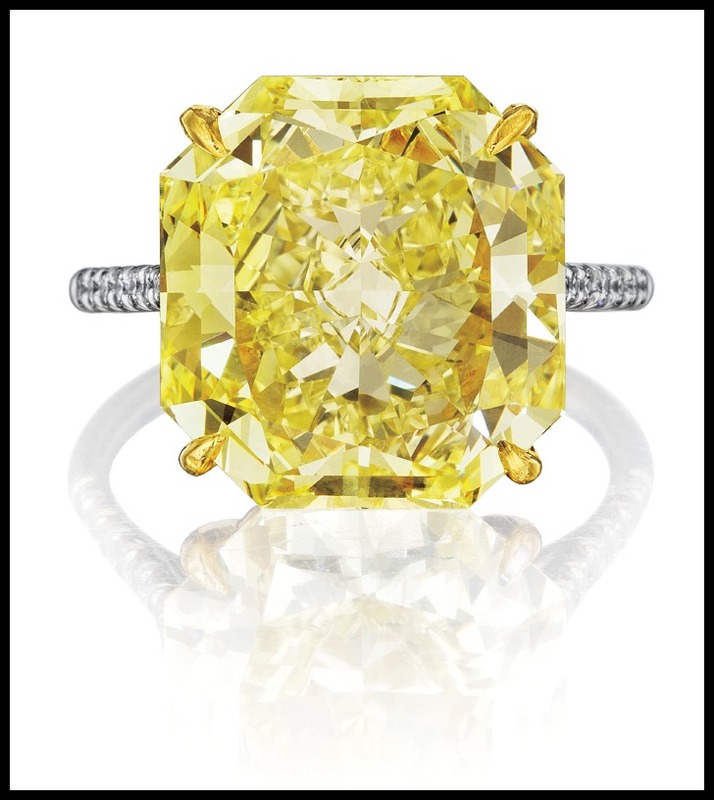 This center stone is 10.16 carats of GIA-certified Fancy Intense Yellow, VVS1 clarity. The shoulders are adorned by pavé-set white diamonds, just to pump up the sparkle a bit more. 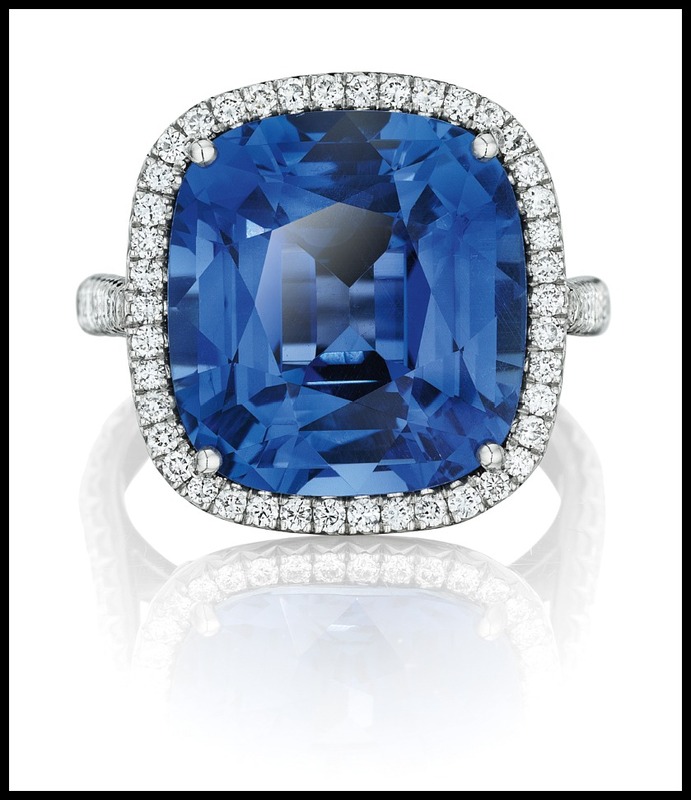 Next, we have this glorious, oceanic unheated Ceylon sapphire and diamond ring. The 13.21 carat cushion-cut Ceylon sapphire is wreathed in pavé-set white diamonds, all set in platinum. It makes me think of mermaids. Just look at that color! I thought we’d alternate between diamonds and non-diamonds, which makes it diamond o’ clock once again. This baby is described in the auction catalog as “magnificent” and that feels pretty accurate to me. 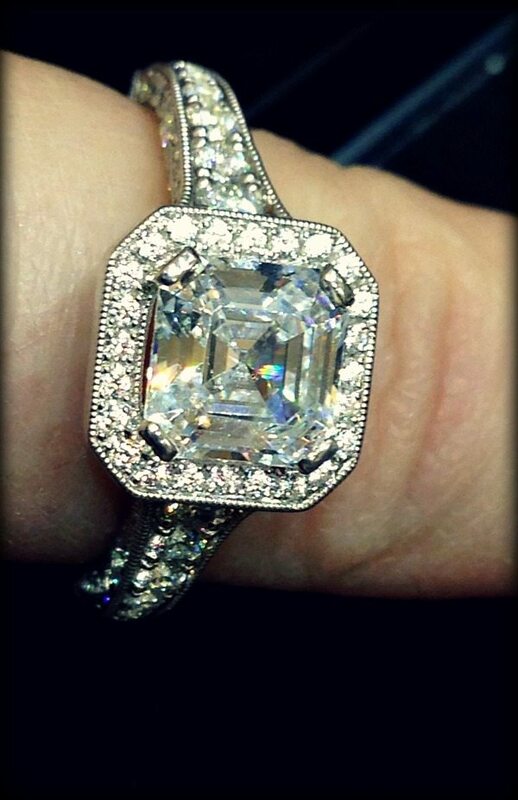 That stunning center stone is 10.54 carat, D color, VVS2 clarity, set in platinum, and flanked by trapezoid-cut diamond shoulders. It could not be more classic and beautiful. 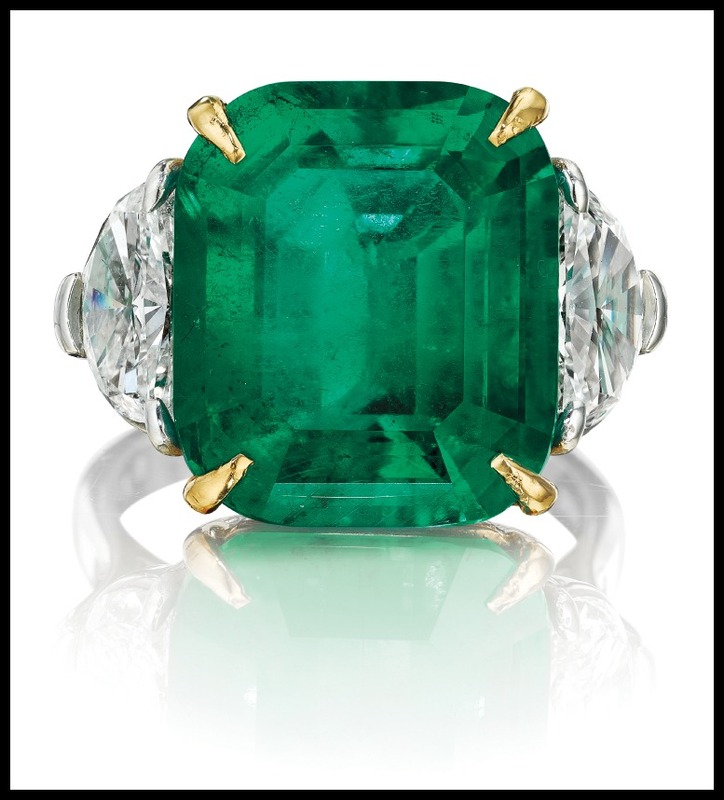 Last but certainly not least, we have this show-stopper of a Colombian emerald and diamond ring (you know I have a weakness for emeralds). This spectacular cushion-cut emerald is 11.20 carats, mounted in yellow gold and platinum, and accented by half-moon diamond shoulders. These beauties were all listed in a recent Phillips auction. All images and info are thanks to Phillips. Please see individual descriptions for source links. Mervis holiday trunk show photo recap: Part II. I promised you there would be more photos from the Mervis Holiday Trunk show, and I’m prepared to deliver. If you missed part I of the recap, please click here to catch up! If I ever form a gang, it will look something like the photo above. Rose gold! 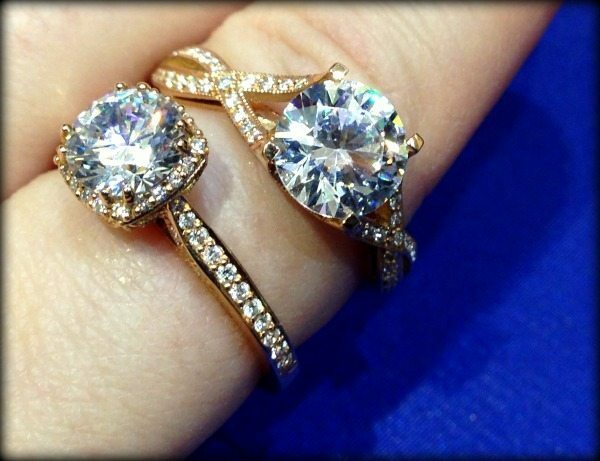 I know how much some of you love Tacori’s Pretty in Pink collection. This was the first time I’d gotten my hands on them and I can confirm that they’re even prettier than you’re imagining they are. How lovely are the side details on the rose gold Tacori Dantela? 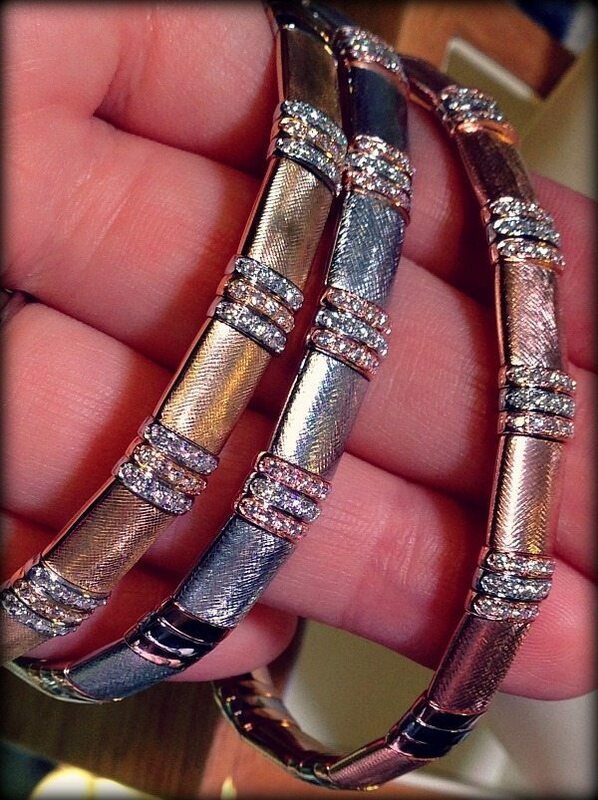 Isn’t this moonstone and rose gold bracelet dreamy? This piece – and the next few – are by David Spivak. 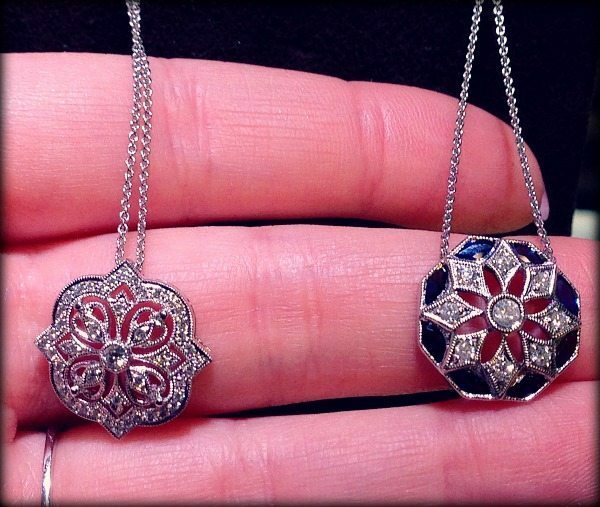 You know me well enough by now to know how much I loved these little Art Deco-inspired pendants. I never used to be a big fan of yellow diamonds but I’ve realized recently that I was just confused. 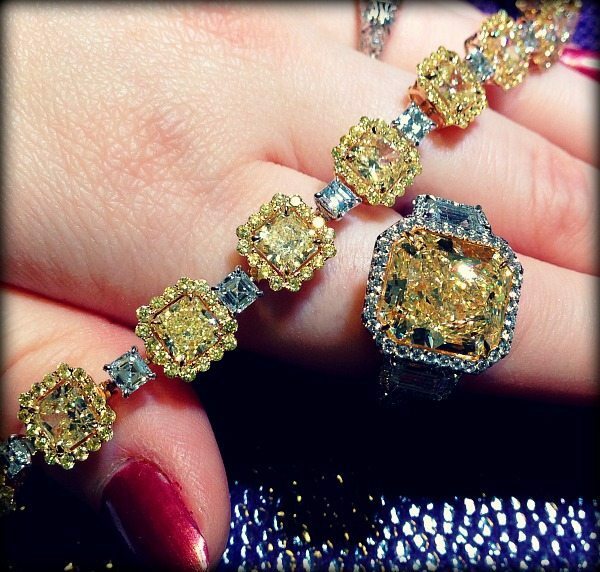 Yellow diamonds are like little cubes of sunshine. This bombshell of a cocktail ring is by Odelia jewelry. As are these diamond hoops. 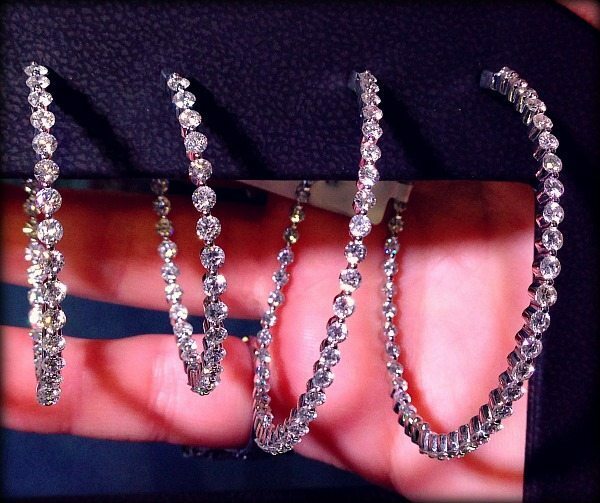 Normally I don’t find diamond hoops to be very exciting, but the shape of these is marvelous. Another Odelia cocktail ring! It looked to me like a cloud of butterflies. The sparkle on this one was unreal. Something colorful to end with! 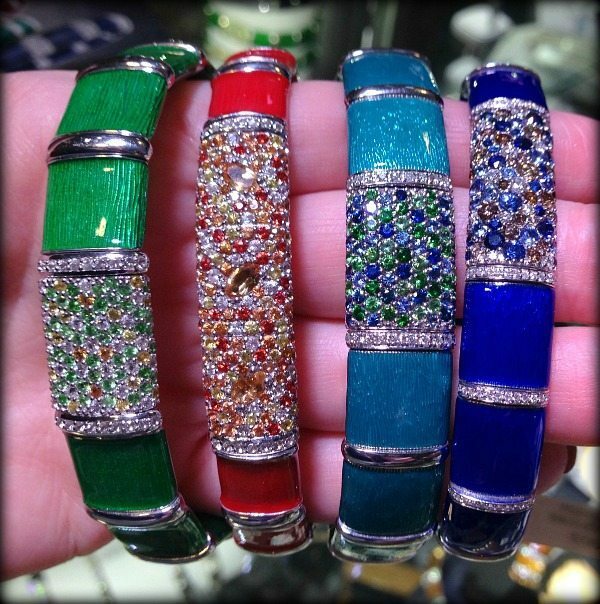 I loved these diamond and enamel bracelets by the Henderson Collection. They’re flexible and can come in any color. A lady could do worse than to have a stockpile of these ready to punch up any outfit. I loved their metallic neutrals too. To ogle my other Mervis Diamonds photo recaps, please click on these links. 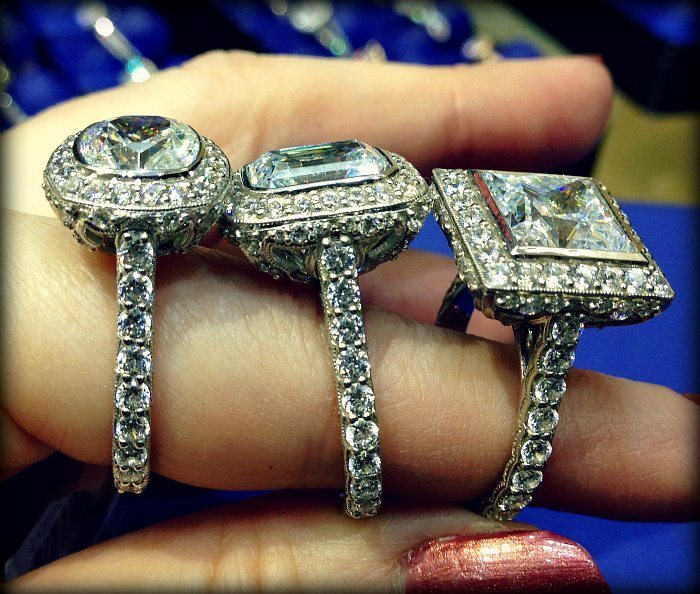 There’s actually a Mervis trunk show this weekend – a Tacori trunk show! They’re even doing a Tacori contest with a giveaway right now. A huge thank you to everyone at the Mervis holiday trunk show – particularly Jon, Hailey, Diana, and Maryam – for being such marvelous hosts and to all of the vendors who let me take up their time and photograph their pretties! Mervis holiday trunk show recap: Part I.
I have a treat for you today, my dears. 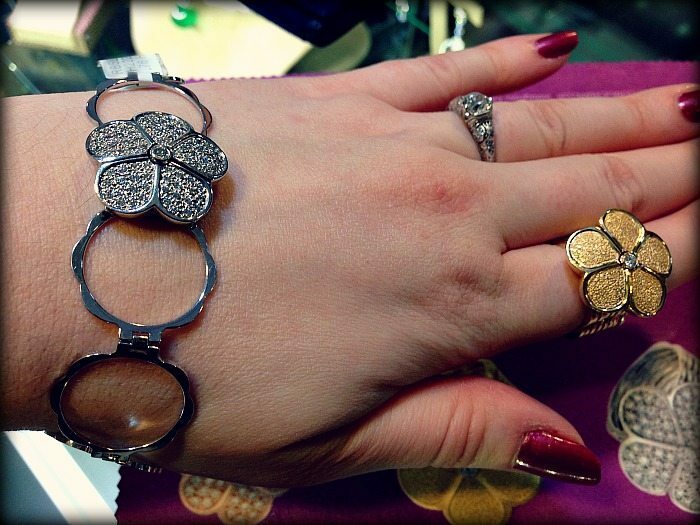 It’s time for another Mervis Diamonds trunk show photo recap! This one was a very special trunk show, the Mervis Holiday trunk show, which is a yearly event held every December. It draws representatives of jewelry brands from all over the country; it’s really a unique opportunity in the DC area. And not only is it a great chance to see all kinds of fabulous jewelry in person, it also involves discounts. And there are snacks. And wine. It’s basically a jewelry cocktail party and you should go next time. This past December was my first time attending, or I would have told you about it already. 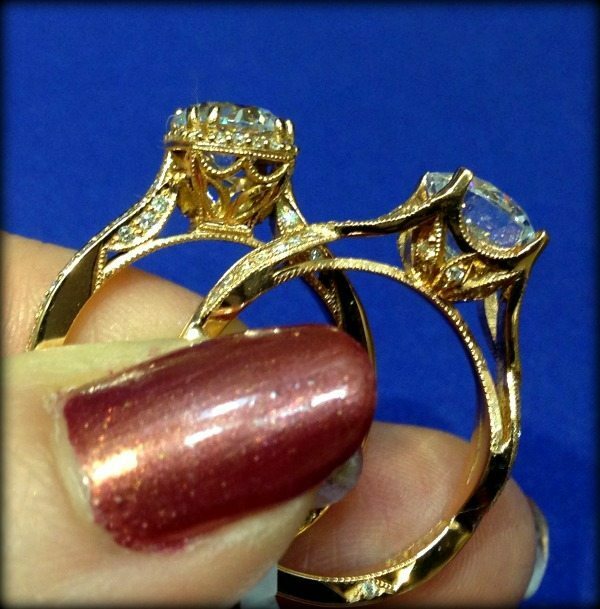 These marvelously dynamic pink and white diamond rings are the work of David Rovinsky, who is also the artist behind those gorgeous yellow diamond pieces in the first photo. He’s also rather charming, and was kind enough to show me photos on his phone of some colored diamond goodies in his workshop. You know who else was there? Jeff Cooper – whose designs you know I love. Here’s a closer look at Hazelle. 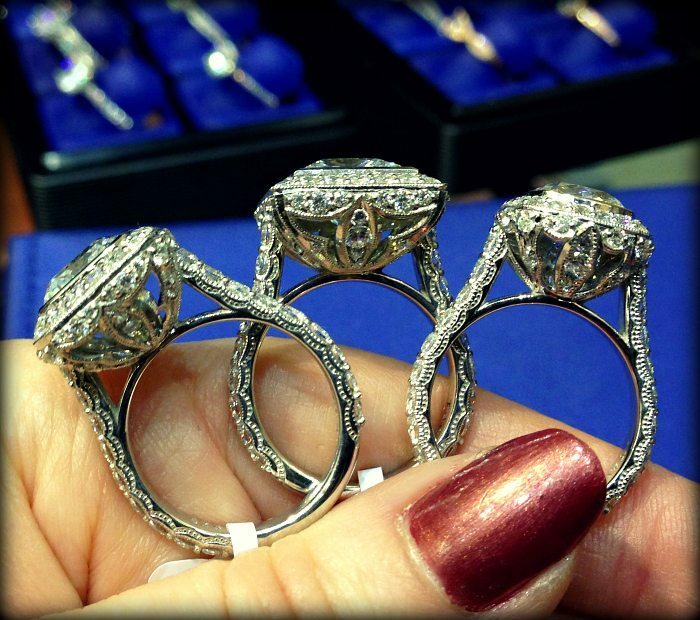 This particular setting was actually a contender in my own engagement ring search. 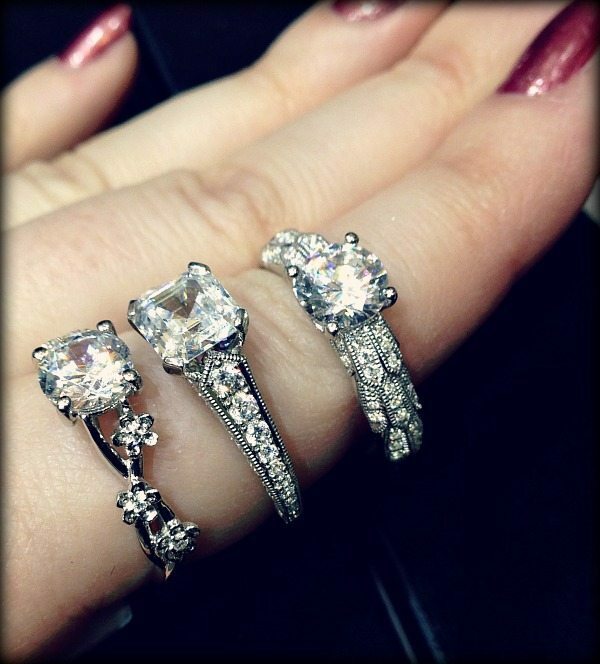 Speaking of which…I also spent a good amount of time trying on Jeff Cooper’s wedding bands. With help of the fabulous Barbara of Adornmentality, I did discover one particular band that looks pretty darn good with my engagement ring. I also had the great pleasure of trying on some Gumuchian designs. This gorgeous by-wome-for-women line is officially one of my new favorites. I didn’t manage to take that many decent pictures of their work, but I hope to get some for you soon. 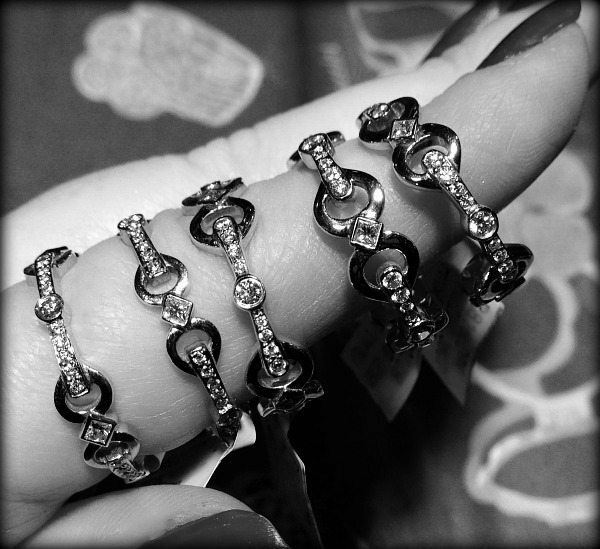 These are Gumuchian’s iconic, equestrian-inspired Gallop rings. I could not adore them more. The subtle diamond accents, the curving, geometric design. I want one for every finger. Or a whole lot of them for one finger. This is Gumuchian’s Ring Cycle, the coolest piece I’ve seen in a while. 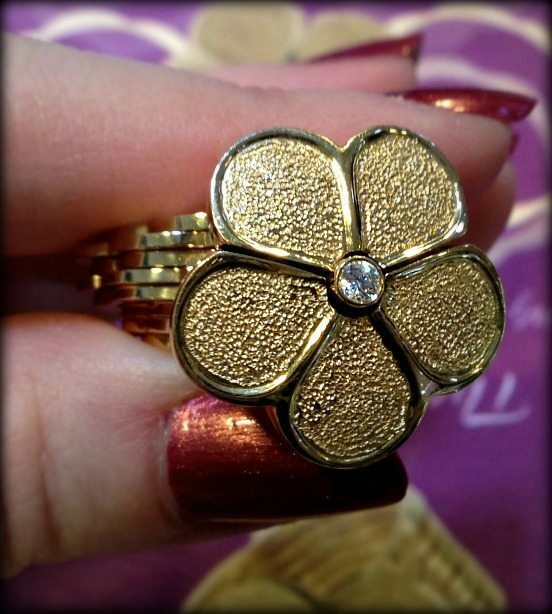 When you press on one of the petals, the ring shank unfolds into a bracelet. The transition is so perfectly fluid and smooth, it’s hard to imagine it’s a mechanical transformation. Not the best picture I’ve ever taken, but it gives you an idea of how it works. 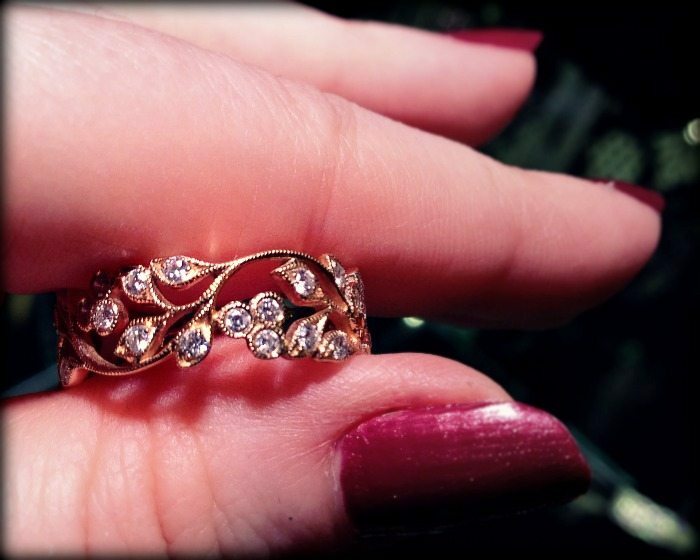 How lovely is this rose gold and diamond band ring by Beny Sofer? I heard that this was one of the most popular pieces of the night and I could certainly see why. I also had a truly fabulous time chatting with Beny Sofer’s rep, Beth. 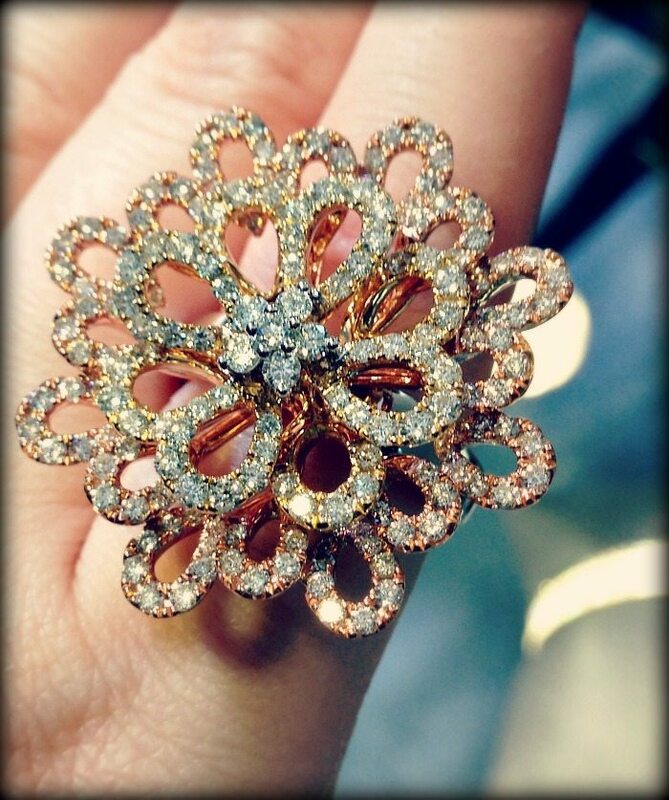 Here’s another Beny Sofer rose gold beauty. And a whole Beny Sofer stack! I loved how these rings played well with each other. Every time I look at this little Gabriel & Co. NY diamond necklace I like it more. It’s very simple, but extremely lovely. 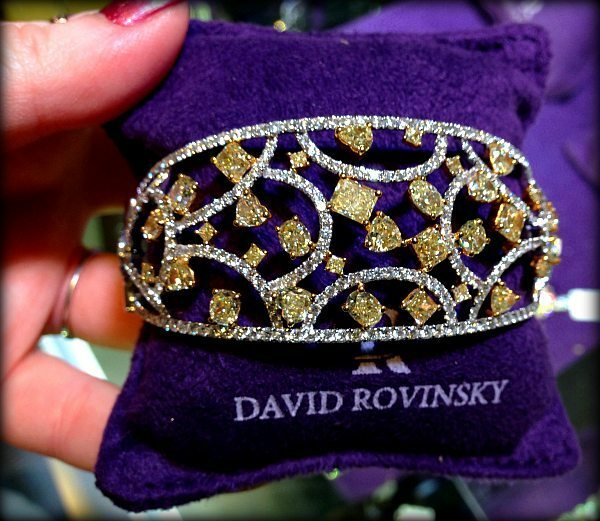 One last Ravinsky yellow diamond. This was a particularly interesting ring because the diamond had rather noticeable inclusion which was only visible from certain angles, but did lower the price of the ring significantly. A great option for someone who wants the big bling but doesn’t care what it looks like under a loupe. I thought I’d leave you a final photo of the big yellow beauty from the beginning. You maybe noticed that the title of this post includes “Part I” – that’s because there’s more to come! Stay tuned. To ogle my other Mervis Diamonds photo recaps, please click on these links. If you’d like to visit a Mervis trunk show yourself, check out this link. 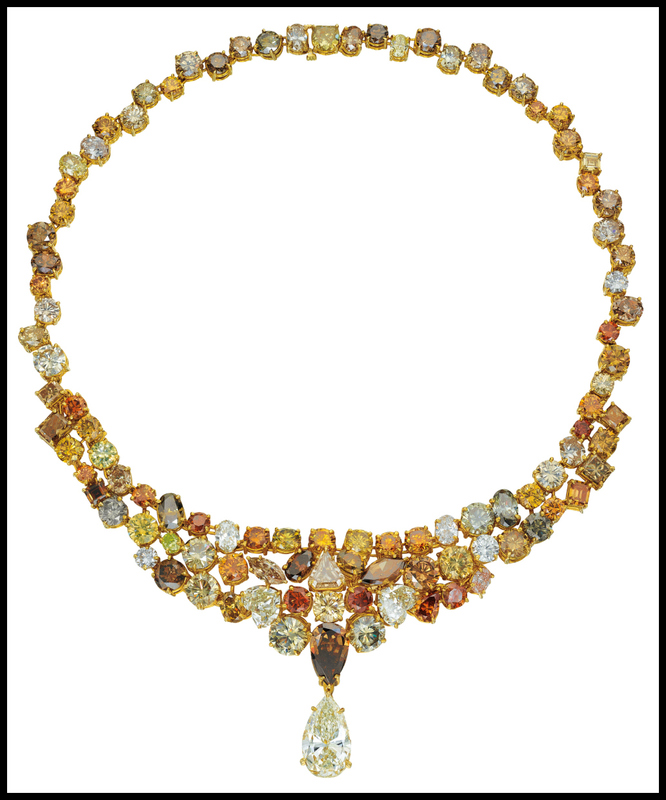 A natural fancy colored diamond necklace. 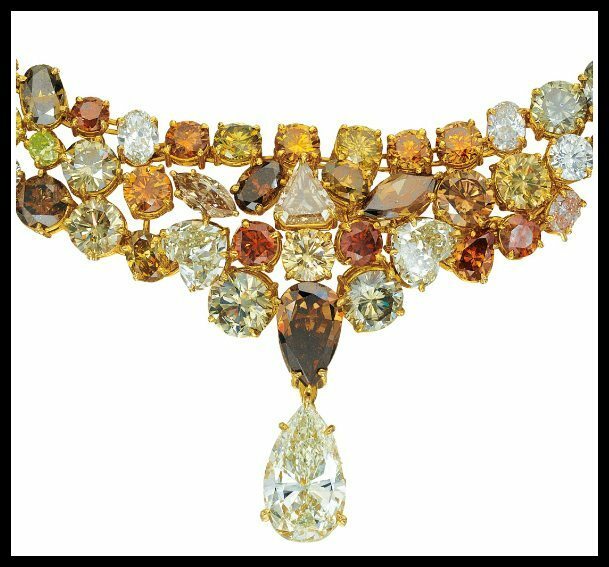 This is an exceptional fancy colored diamond necklace. 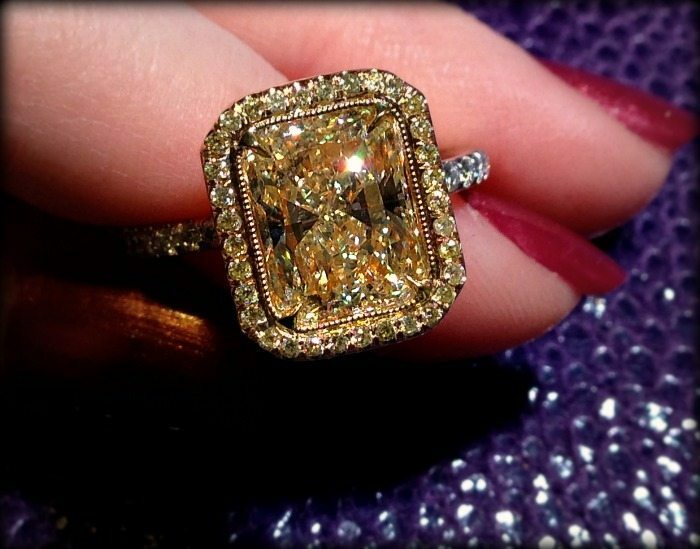 What you’re looking at there is 125.92 carats of natural fancy colored diamonds, all GIA certified. It was a bold move to collect this many differently-hued stones amd decide to set them all together into one piece with no apparent pattern, but I think the result was magnificent. 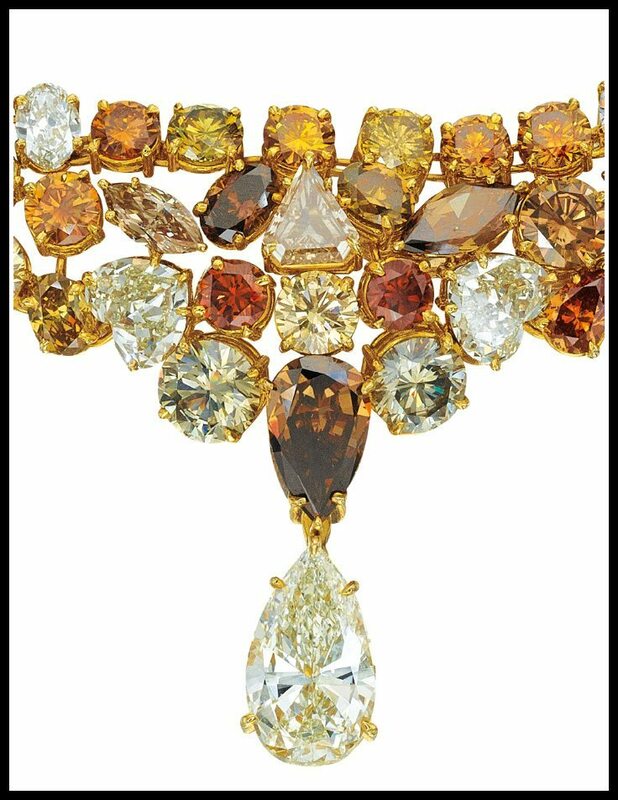 The necklace is 18 inches long and the diamonds are all set in 18 karat yellow gold. The stones that are accompanied by GIA reports are certified as: Fancy Deep Brownish Yellow (2.81 carats), Fancy Orangy Yellow (1.27 carats), Fancy Dark Brown-Greenish Yellow (2.34 carats), Very Light to Light Yellow (18.37 x 11.12 x 6.75 mm), Fancy to Fancy Deep Brownish Yellowish Orange (6.00 x 6.17 x 3.35 mm), Fancy to Fancy Deep Brownish Orange (5.03 x 5.05 x 2.98 mm), Fancy to Fancy Dark Yellowish Brown (5.80 x 5.84 x 3.75 mm). What do you think? Do you like the mix of colors, or would you prefer a uniform hue? 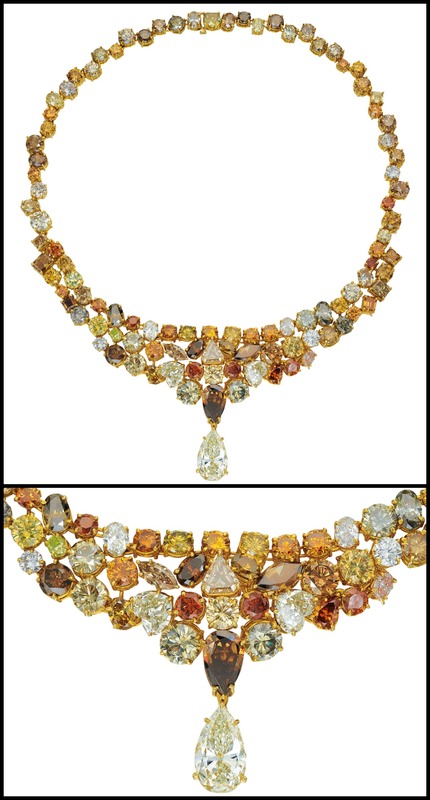 This fancy colored diamond necklace was listed in a December 2013 auction at Phillips. All images and info are thanks to Phillips.